To celebrate the publishing of Atsuko’s first cookbook Sushi Made Simple , we would love to share the love of sushi with you! In this hands-on sushi-making class, Atsuko will guide you through the art of sushi making process, step-by-step, combining traditional techniques and new approaches. First of all you will make the classic premium white sushi rice, then make a variety of sushi including maki (hoso maki, California roll), and some kinds of nigiri. You will also learn to make the famous Japanese rolled omelette tamagoyaki using.. a square frying pan! We always provide fine quality ingredients and a glass of Junmai sake at the end of the class to celebrate your accomplishments! 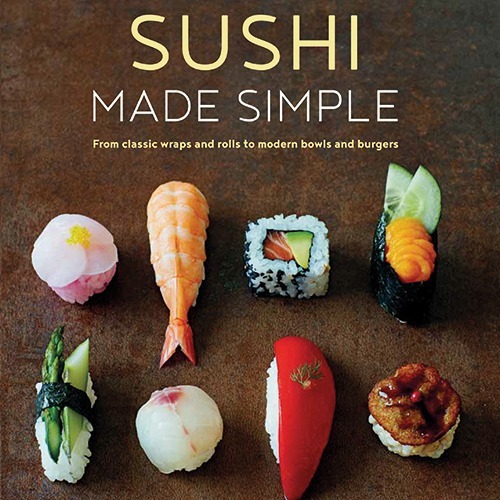 You will also be given a copy of Atsuko’s signed cookbook “Sushi Made Simple” to take home, the perfect for a gift! Also you will lean how to source the fish fillet for your sushi and the hints of making some rolls suitable for your sushi party! There will be the alternatives for vegans or vegetarians. Please let us know your dietary requirements in advance. We start with introducing a variety of sushi, then a cooking session. Next you will make your own sushi and finally eating with a glass of fine quality Junmai Sake! Atsuko’s signed brand-new cookbooks will be included in this class fee.